Can you paint with all the colors of the…pantone? Of course, this would all be easier if we chose one Pantone code for each of the two colors and stuck to it. 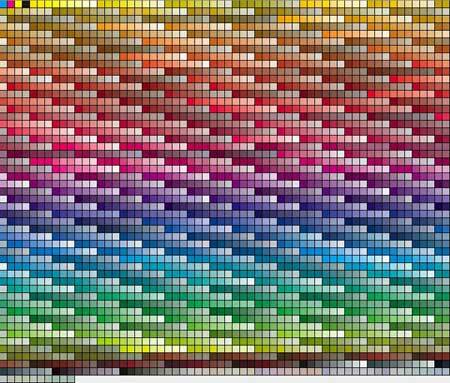 Pantone is the bible of colorists and designers worldwide, offering color charts and palettes, forecasting which colors will be popular in a given year, even making up new colors. (Apparently, making up colors isn’t such a novel thing: a 19th-century British Prime Minister studied every color reference in The Odyssey and The Iliad and found no mentions of blue. In this Radiolab segment, a linguist and neuropsychologist discuss why, across cultures, blue is the last color to appear in human understanding). While you or I might not associate 2009, for instance, with Palace Blue and Rose Dust (the colors forecasted that year), perhaps in some later year we’ll be able to see a pattern in the popular colors of the 2000s. I found a complete list of color-palette-by-decade since the 1880s, and there are some recognizable trends: the muted tones of the 1920s, the war-inspired colors of the 1940s, the neon-hued 1960s. And, of course, nothing is more iconic of the 1950s than Avocado and Harvest Gold. May they rest in peace. After so much time spent matching colors, though, I was feeling pretty cocky. I thought I was pretty good at identifying when my chocolate brown needed just a little more red, or my turquoise needed a bit more yellow. And so, when I came across an online color challenge, I was sure I would get a great score. The challenge consists of 4 rows of 20 hues which you must arrange in order, from rose to turquoise to lavender and back. I lined them all up, checked my results…and found out I am terrible at distinguishing hues, except for in a few cases. I was shocked. 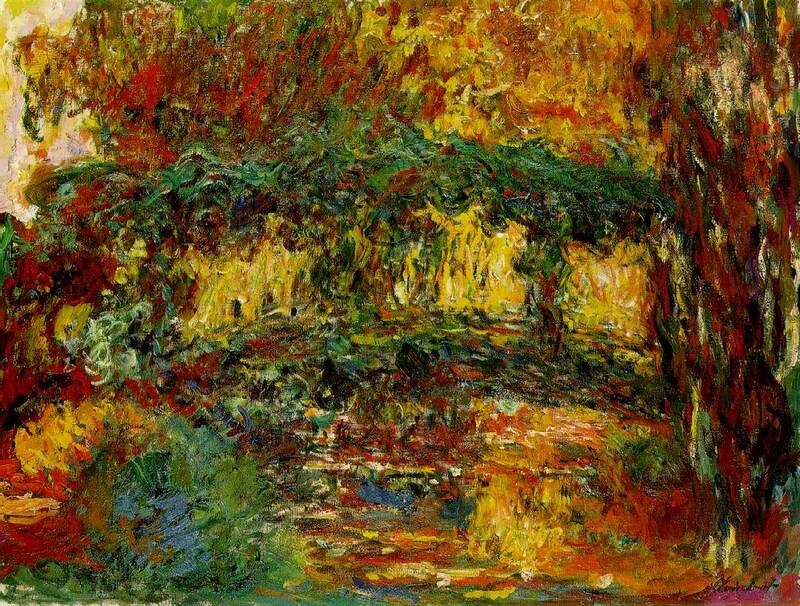 But heck, even Monet got his colors off a little bit, especially near the end of his life. Maybe this test just signifies that I’m a genius. Monet: wrong? Or brilliantly right? PS. Since everything relates back to books for me, here’s a list of 13 authors with corresponding color palettes. Lovely. 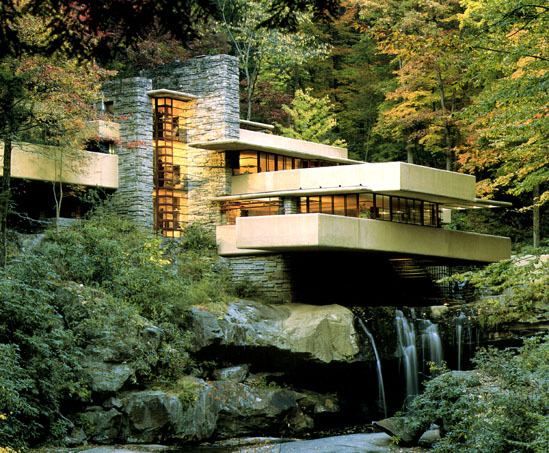 No childhood as the offspring of an American architect is complete without a visit to Fallingwater, Taliesen, and the Guggenheim Museum in New York. Yes, our family road trips often veered off course to pay homage to one of the greatest architects of all time: Frank Lloyd Wright. The great thing about visiting any new place with my dad, the architect, is that his perspective is so different from my own. Check out that mansard roof! he exclaims. Is that really faience glazed clay tile? Thus, with him, I notice the architectural detail in new cities much more often than I would on my own. Yeah? 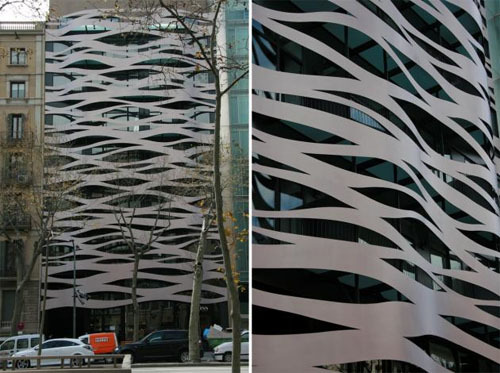 So your exterior looks like waves. So what? 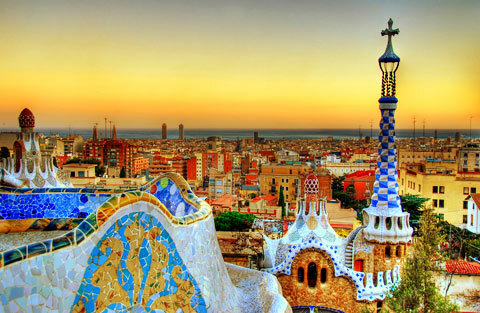 Of course, when you talk about architecture and you talk about Barcelona, there is one man so important that he overshadows everyone else: Antoni Gaudí (literally–the Sagrada Familia bristles out of a relatively flat skyline). In fact, it’s hard to think of another architect who has as completely reconfigured the nature of a city, or another city that lures tourists with the treasures of just that one architect. Without Gaudí, Barcelona would be just another European city with a nice old cathedral and street vendors willing to sell you individual beers from six-packs they store in the sewer system (don’t tell me you can’t find that in Munich). 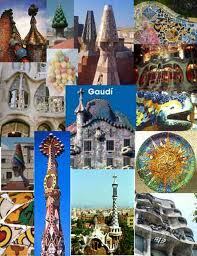 In fact, I was skeptical about Gaudí’s style before I visited Barcelona. It just seemed so, well, gaudy. Up close, though, his work is so utterly intricate and it so perfectly combines elegance with whimsy that it’s nearly impossible to resist. I found myself gaping in awe at the heights of the Sagrada Familia, a structure that attempts to define the word “exaltation” through stone. And then there’s Parc Güell, which feels like a multi-layered underwater Disney creation. 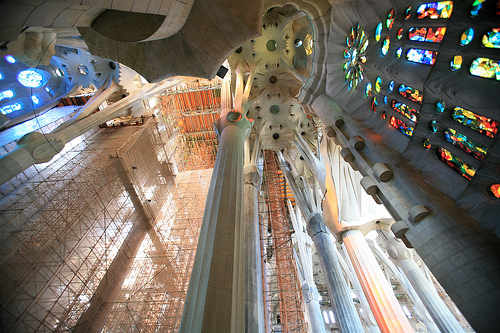 Gaudí is one of those architects who did not base what could be done on what had been done. 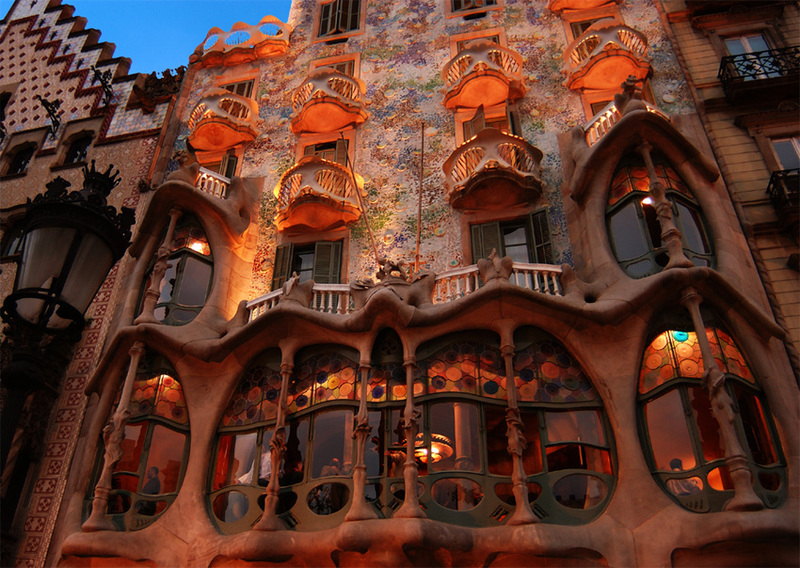 In his building designs, Gaudí used shapes common in nature seemingly irreconcilable with the rigid materials necessary for the buildings to stand. Yet his pillars mimic trees perfectly, his tiles take on the form of tropical fruits with ease. Balconies settle like sand dunes. I can only imagine what more my dad would point out if he were there. Just over a quarter century ago, a recent college grad like me was wondering what the #$%& he should do with his life. Instead of starting a blog (which would have been quite the innovation at the time and surely would have made him a million times richer than the profession he chose), he opened the University of Minnesota’s graduate programs catalog. Starting at “A” he ran his finger down the list. Accountant? No. Agricultural Engineer? No. OH! Architect! Why not? And so this man became an architect. For a few years, I told this story as though it were my dad with the alphabetical impulsivity until he gently informed me that it was a friend he’d met at the U of M’s architecture program, and not him. 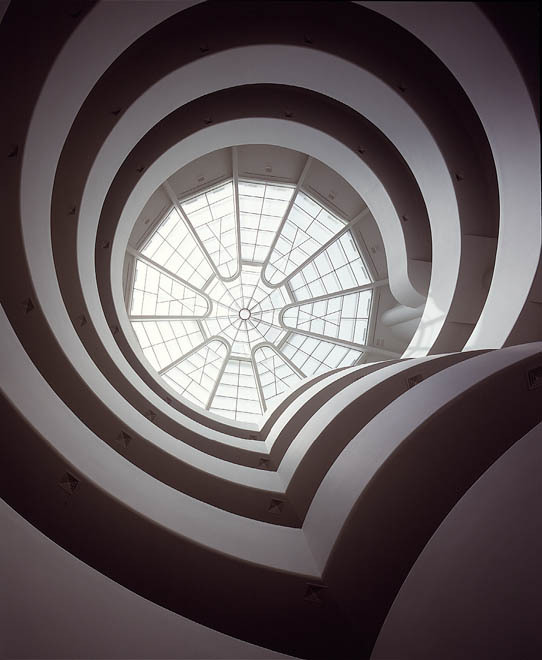 Architecture was a more obvious fit for my dad, a person who is both extremely creative and mathematically precise. He’s also quite adept at writing in all capitals–architects’ script–and not look like he’s shouting on paper. 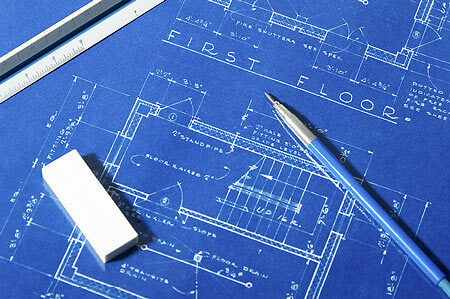 Since my dad is an architect, the profession always seemed normal to me, yet whenever I told friends or teachers their eyes would light up with respect and interest. Thus, I began designing houses as well. Dad would bring home graph paper and I would create mansions with swimming pools, movie theaters, indoor dog parks. Sometimes I would accompany him to his office in Minneapolis and look at the drawings that he and his colleagues were producing (though usually I was more interested in hanging out at the children’s bookstore below his office, the Wild Rumpus, that features real animals in and around the shop). I hadn’t given much more thought to be an architect myself until about two months ago, when I was lying awake at night trying to figure out my future. To get my mind off this quarter-life-crisis stress, I turned on my light. 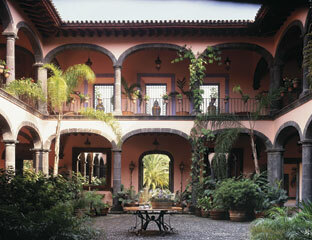 I’ll just design a Mexican hacienda, I thought to myself. So I got out my sketch book, and began to dream up some key elements of this house: a courtyard with a fountain in the middle, a library with views out into the jungle beyond. But I ran up against the problem I always had as a kid: I wanted the house to be big, but I didn’t know what to do with all the space. That is, I had plenty of ideas about how to fill in this box of a Mexican hacienda, but no sense of how the rooms would flow from one to the next. There was no function in my form. Last week I was talking to my dad about his day at the office. He was excited because he at his favorite stage in a project: he was figuring out all the dimensions to add to the final drawings for an addition. This, he said, is like a very intricate puzzle in which he must keep hundreds of numbers in his head at once to put it all together. I had recently dealt with a similar puzzle, though on a much smaller scale. For Christmas, I decided to create a cover for my brother’s new Kindle out of leather; my least favorite part was all those measurements I had to keep in mind–how large the chipboard needed to be, how much leather to cut, where to sew on the elastic (actually, my least favorite part was how many times I stabbed myself with the sewing needle, or perhaps the night I lay moaning on the carpet about how this *&#%-ing Kindle cover was unsalvageable). Seeing how excited my dad was about measurements, and remembering my despair when the leather I’d cut didn’t quite fit, I realized that the kind of puzzles one needs to solve in architecture are just not for me. Function is not my forte. On a final note, my Kindle cover did end up fitting and, as they say, if the Kindle cover fits, use it. At least, that is, until the decorative elements fall off and you realize they were only there to cover mistakes, or the elastic snaps off when riding the subway and your Kindle slips into the abyss of slush-covered designer boots.